​About brick paver construction in Jacksonville FL. About how brick pavers are installed and function as a paver system proving a beautiful surface for Driveways, Walkways, Patios and more. A typical block paving stone manufacturing plant. Interlocking concrete pavements, more commonly known as brick pavers or paving stones are individual fast setting dry mix pre-cast units, or blocks. Modern pavers have been around in the united states since the 70’s and in Jacksonville since the 80’s. Interlocking paving stones are most often installed over a compacted crushed rock or stone base. Concrete paving stones can be used for roadways, driveways, walkways, patios, pool decks, parking lots, courtyards and even airports and loading docks. Brick pavers are connected with a fine sand that is swept between the narrow joints, sand particles are spread over the pavers and tamped down with a vibrating compactor, which helps to “set the sand” vibrating it deep into the joints. The sand stabilizes the interlocking pavers, yet allows for some flexibility. A paver system does not easily crack, break or buckle like poured asphalt or poured concrete. Patio constructed of brick paving stones, interlocking together. Because of the narrow joints and the interlocking properties of the pavers the sand does not easily wash out with rain or hose water. Pavers can even be pressure washed without needing to be re-sanded in most cases. A sealer can be used to further lock or coagulate the sand. 20mm / about 1 1/8”: Sometimes called a “thin paver”, “cap paver” “remodel paver” or “half paver”. These are designed to overlay an existing suitable concrete base in areas where a thick paver would not work. Often made to match the color and size as the full thickness pavers. 40mm / about 1 5/8”: typically bought at Home Depot or Lowes which are suitable for foot traffic on patio and walkway applications. *Moderna does not install these pavers. 60mm / about 2 3/8”: (most common) designed for residential driveways, patios, walkways, pool decks and some roadway applications. 80mm / about 3 1/8”: These are designed for heavy or higher speed vehicular applications. Sometimes called a commercial or Industrial paver. Delivering a truckload of pavers to the paver project in Jacksonville. Because a pallet of pavers can weigh up to 4,000 lbs and the associated trucking cost, most pavers Moderna installs are manufactured in Jacksonville in one of the two local manufacturing plants. Though Moderna has installed pavers that some customers have found as a “must have” from other area manufacturing plants as far south as Miami or as far north as Atlanta. Some the benefits of pavers over poured concrete include a hugely diverse selection of colors and styles accommodating a wide range of architectural style, color palettes and decor, a high compressive strength, pleasant look, fast installation, easy removal and relaying. 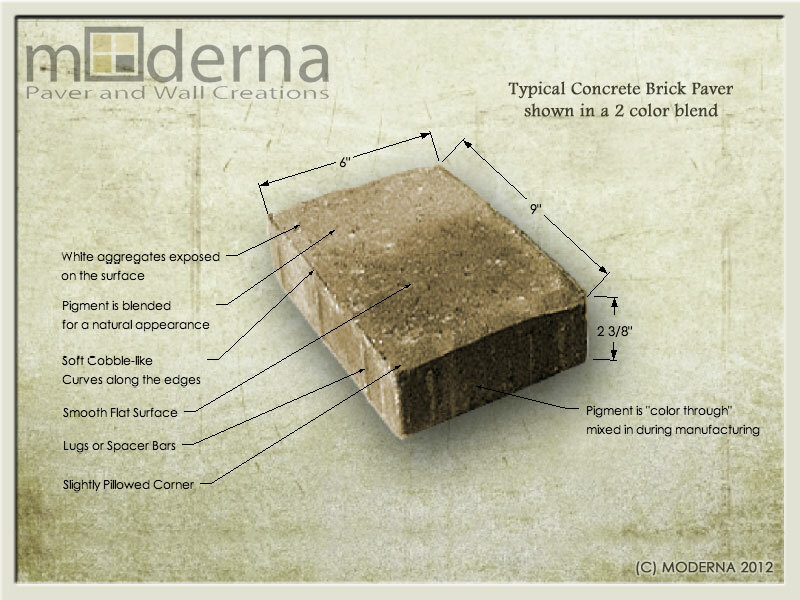 Typical concrete brick paver available in Jacksonville.